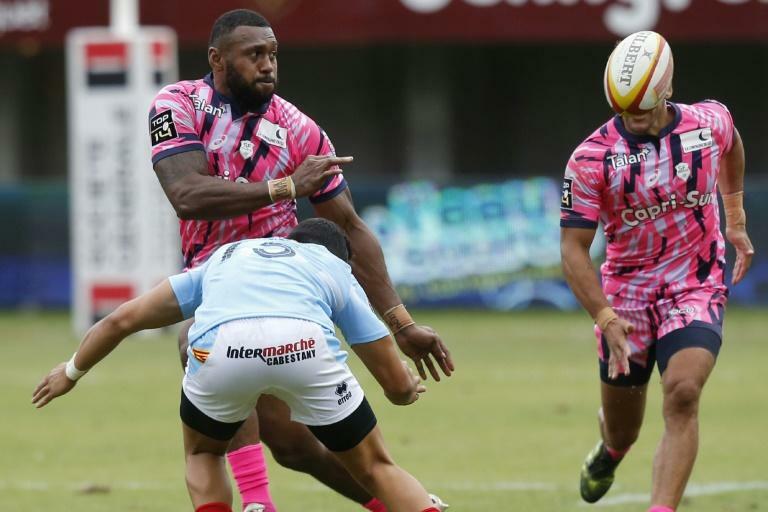 Stade Francais kicked off the Top 14 season and their new era under coach Heyneke Meyer in style with a 45-16 thrashing of newly-promoted Perpignan on Saturday, while Toulon lost at home to Racing 92. The 50-year-old Meyer, who led his native South Africa to the 2015 Rugby World Cup semi-finals, saw his men run six tries past Perpignan at the Stade Aime Giral. Stade struggled badly last season, finishing down in 12th place and only avoiding relegation on the final day of the campaign, but, financed by Swiss billionaire Hans-Peter Wild, they have the biggest budget in the French top flight. The capital-city side raced into a 29-3 half-time lead as they laid down a marker to their title rivals at the earliest opportunity. They even had to manage with 14 men for over half the match, after Italian talisman Sergio Parisse was sent off shortly before half-time. "It's a great win and we're savouring it," said Stade forwards coach Pieter de Villiers. "We're especially happy for the players who worked hard during the off-season, we insisted on physical preparation to be ready and today it paid off. "Yes, we have high ambitions. Our owner gives us the means for those ambitions. But our first ambition is to establish a winning culture." France flanker Sekou Macalou and full-back Kylan Hamdaoui both scored two tries for the visitors, with Fijian international Waisea Nayacalevu and scrum-half Piet van Zyl also touching down. Former Springbok fly-half Morne Steyn kicked 16 points as Stade sealed a comfortable bonus-point victory. There will be easier days for Perpignan, for whom former Ireland half-back Paddy Jackson scored a try and a penalty on his debut, with their other points coming from a penalty try. Later on Saturday, Scotland fly-half Finn Russell scored two tries as Racing claimed an impressive 25-9 win at Toulon. Last season's European Champions Cup runners-up trailed 6-3 at half-time, but hit back as Russell scored 12 points in a crazy three-minute spell just after the interval. Trailing by six points and with Racing having a man in the sin-bin, Toulon tried to force the issue in the final 20 minutes, only for Rhys Webb to literally throw away their chances of salvaging something from the game. The Wales scrum-half's loose pass was easily intercepted by Juan Imhoff, and the Argentinian speedster raced clear to touch down, before Russell added another conversion and penalty to finish his day with 20 points. Elsewhere, Toulouse snatched a 16-16 draw at last season's surprise semi-finalists Lyon, as France full-back Yoann Huget grabbed a crucial second-half try before Thomas Ramos' late drop goal sealed two points, after the full-back had earlier struggled with his kicking from the tee. "I made the drop goal at the end, but that doesn't make me forget my failures on the three missed penalties," said Ramos. "It's up to me to work in the coming weeks." However, Lyon did lose former England back Delon Armitage in the 64th minute, with the club confirming he had suffered a serious left knee injury. Clermont's bid to put last season's dreadful title defence behind them got off to the perfect start, as former All Black Isaia Toeava and Alivereti Raka both crossed twice to help them crush Agen 67-23, scoring 10 tries in total. Scottish scrum-half Greig Laidlaw also kicked 17 points for Franck Azema's men, but it is their away form that they will need to improve on from last term after winning just one of 14 games on the road in 2017-18. Bordeaux-Begles powered past Pau 41-19, while La Rochelle narrowly managed to hold off Grenoble as a 75th-minute score from Jean-Charles Orioli secured a 28-21 victory. The big game of the opening weekend is on Sunday, as reigning champions Castres launch their title defence against Montpellier in a repeat of June's final.